This is not a gif assignment. QT_PROOFSHEET will take a QuickTime movie and render it out as individual frames in a grid. By default, it takes about 100 frames of your movie and fits it onto an 8.5 x 11 document, with timecode imprints. By using different parameters you can make a strip of stills from a quicktime movie the one I am using here is 576 x 8208 pixels. This is then animated with css. The qt-proofsheet adds the time stamp, you can minimise them but I found them useful is creating the animation. 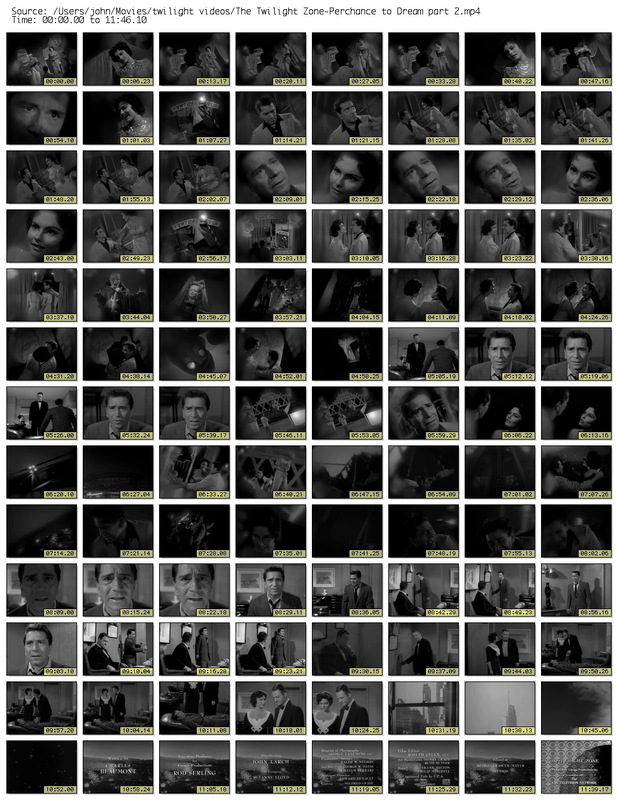 The stills were grabbed from ‘Perchance to Dream’ an episode of the twilight zone. I am afraid I am a bit sort of time so this post is a bit lacking in information, but this technique is an interesting take on the animated gif. The quality is fairly good and the file is 654kb. Right-Click and open in new window to see at full size, this could be useful for analysing film.